If you are looking for great Gatlinburg cabins and Pigeon Forge cabins, you've come to the right place! With over 300 incredible properties, famously great prices and outstanding customer service, American Patriot Getaways is the most trusted resource for Pigeon Forge and Gatlinburg cabin rentals. Break away from the routine and call us at . Our cabin specialists will be happy to help you choose from our many cabins in Gatlinburg and Pigeon Forge, so that you have an unforgettable vacation experience. #1 recommended cabin rental company in the Smokies. Over 300 cabins to choose from with all imaginable amenities. Amazing cabins at unbeatable prices and discounts of up to 50%. Our guest service specialists are always just a call away. American Patriot Getaways has been "creating guests for life by providing the experience of a lifetime for our guests" since 2000. Our company is the original Pioneer for Gatlinburg cabin rentals and Pigeon Forge cabin rentals. American Patriot Getaways offers the best and most diversified selection of Pigeon Forge and Gatlinburg Cabin Rentals in the Smoky Mountains. 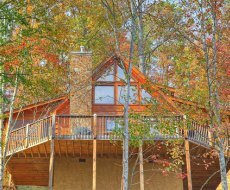 When personal attention is needed in selecting the perfect Smoky Mountain rental cabin give us a call and talk to one of our cabin specialists. Our dedicated reservations staff has the knowledge and tools needed to find the perfect Gatlinburg Rental cabin for your next Smoky Mountain getaway. We look forward to the opportunity of hosting you on your next trip, and want to welcome you to our little neck of the woods – Gatlinburg and Pigeon Forge TN! Whether you are planning a family trip or a romantic getaway with your loved one we have the best selection in Gatlinburg for you to choose from. Our cabin rentals offer a vast variety of amenities that you can't find in any hotel. Some of the more popular amenities our guests prefer include private hot tubs, jetted Jacuzzi tubs, home theaters, pool tables, and fireplaces. Fully appointed kitchens and outside grills offer guests the option of dining in, and most of our homes include washers and clothes dryers for those extended stays. We want our homes to feel like your home when you are visiting one of our outstanding Gatlinburg cabin rentals. 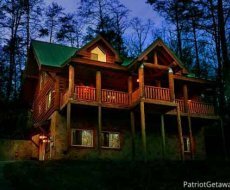 At American Patriot Getaways, you'll find our selection of Gatlinburg cabin rentals include everything from secluded honeymoon cabins nestled in the woods to easy access / no mountain road cabins with community swimming pools and exquisite views, to luxury Gatlinburg cabin rentals for your large group. Whatever your vacation needs are, you are sure to find that perfect cabin rental for you to enjoy on your next trip to Gatlinburg TN. If you're searching for an action packed Smoky Mountain Adventure then our selection of Pigeon Forge cabin rentals is the best way to stay close to the action while still getting that true Smoky Mountain log cabin experience. With convenient locations close to all Pigeon Forge has to offer including Go-karts, dinner shows, miniature golf, outlet shopping, and even the Dollywood theme park, our Pigeon Forge cabin rentals are the perfect home base for your adventure. When the day winds down, you'll enjoy escaping back to your peaceful cabin in the mountains! Our Pigeon Forge cabin rentals will make you feel right at home. Soak your worries away in the outdoor hot tub, prepare that favorite family recipe in a fully stocked kitchen, or just enjoy some family time telling old wise tales around a camp fire. No matter what your vacation plans include you’re sure to find what you are looking for in our outstanding selection of cabin rentals in Pigeon Forge TN. Are you bringing a group, celebrating a reunion, marriage, or even traveling with your sports team? Every Smoky Mountain adventure is more fun when you stay in the right place! Our family sized Pigeon Forge cabin rentals can accommodate up to 40 people in one unit! If you prefer to spread out, then reserving neighboring properties is also a great option. Let us know your plans & how many people you are traveling with, and our friendly reservation staff will help you locate the best Pigeon Forge rental cabins for your group travel. Give us a call today, our number is . American Patriot Getaways is always a great choice for cabin rentals. This has been the 3rd time we've used them for our Smoky Mountains vacations and not once have had a problem. I highly recommend their services!